A moderator declined my migration flag—what are the policies for flagging questions for migration? A lot of questions get asked on Meta about declined moderator flags. I don't really want to be one of "those people" who asks about every little possible mistake, but I am a little curious about this particular instance. To me, this perfectly fits the bill for migration to Code Review. This is a good, well-described, well-written question. I flagged for a request for migration, but (a number of days later) the flag was declined. There are a few explanations I could come up with for this. The question could have been misinterpreted as the OP asking to finish broken code. That wasn't the case, but it isn't perfectly clear. Though the question was originally flagged when it had no answers, a short time after I flagged it, an answer was posted and subsequently accepted. Perhaps the most compelling reason—while this question would fit very nicely on Code Review, it isn't necessarily off-topic on Stack Overflow. In the event that the flag was declined due to one of the first two reasons, that would seem like a simple mistake. It happens. On the other hand, it seems more likely to me that the third possibility is correct. This raises the question: should I ever request migration to a site that might be a "better fit" if the question is on-topic on SO? I don't think it could hurt, but I'd understand if that were the policy. This was not a good candidate for migration. 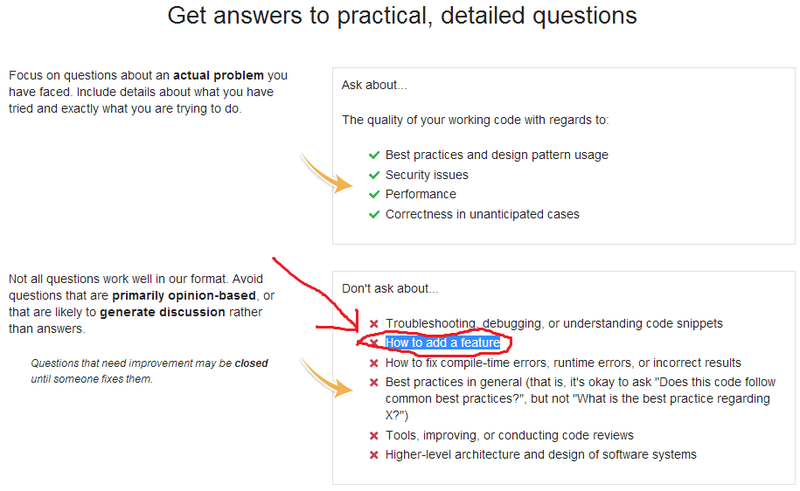 It is on-topic at Stack Overflow, and migration is intended for off-topic questions. This is a perfectly reasonable Stack Overflow question. OP was not asking us to look through a page of code for problems. OP was pointing out a specific issue and asking for advice. That is exactly what Stack Overflow is for. I got 11 upvotes asking a similar question (which, ironically enough, was itself migrated from Programmers.SE). Questions can be on-topic on multiple sites at once. In that case, it's up to the asker to choose a site. When you migrate a question, you are closing the original and creating a duplicate on a different site. If there's no valid reason to close the original, you shouldn't do that. That sort of stuff is off-topic for Code Review. Questions containing broken code or asking for advice about code not yet written are off-topic, as the code is not ready for review. After the question has been edited to contain working code, we will consider reopening it. "how would you create a recursive append function"
"Here's what I have so far"
The title doesn't reflect what the code does. The question is not about improving the existing implementation, it's about expanding the existing implementation. Perhaps it is finished code and should be reviewed. That's okay. But in that case, the question should be edited to be less "uncertain" - Here's my problem, here's my solution, here's my tested implementation. Not the answer you're looking for? Browse other questions tagged discussion support flags declined-flags migration . For how long are the flagging rights disabled for a user? Why was my flag asking a moderator to migrate my own question declined? Why was my custom moderator flag declined?